Each size variant of each product must have a unique barcode, meaning that a strain of cannabis that is available in four sizes (i.e. 1 g, 3.5 g, 7 g, 15 g) must have four unique product barcodes. Keep their existing barcodes as long as they are legitimate, functional and non-conflicting with any other sellable item(s) globally. If the barcode is conflicting or illegitimate, the product will not be listed. The GS1 Expanded DataBar and Expanded Stacked DataBar symbologies. The Expanded DataBars will contain (in this order): GTIN (AI- 01), Expiry Date (AI- 17) OR 500723 if no expiry date, LOT (AI- 10). 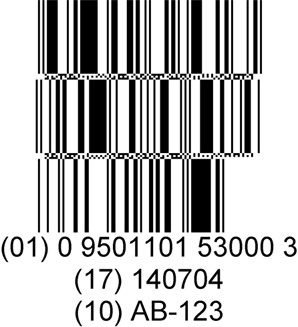 GS1-128 (GTIN, Expiry OR Default, and the LOT in this order), Interleaved 2 of 5, UPC OR EAN. GS1-128 (likely only the GTIN) or Interleaved 2 of 5), Interleaved 2 of 5, UPC OR EAN. – ALL  barcodes (retail, inner and case) must scan at first pass. – For Cannabis Products, the lot number (AI 10) and expiry date (AI 17) of the inner pack and master pack must match the lot and expiry date of the product pack. -Accessories Products must not contain AIs. – Multi-pack products  must have a unique barcode on the outside package that is different than the barcode of the individual units contain within. – Multi-pack barcodes need to be on the individual unit(s) inside the multi-pack must be positioned in such a way that they cannot be scanned. If the OCS receives any shipment with non-compliant barcodes the shipment will be sent back to the supplier or the supplier will cover all re-work costs to re-labeling. It should also be noted that all re-work associated with barcodes will delay the product from being available for purchase on the eCommerce website.